Blog SparkPost Dating Apps and Triggered Email: It’s a Match! Somewhere along the way Cupid stopped shooting arrows and started sending emails. It’s hard to say exactly when this shift happened but I’d guess it was sometime around 1995 when Match.com was first launched. For nearly a quarter of a century, people have turned to the internet to find love through websites and since 2009 through dating apps. While most users interact with brands like Tinder, Hinge, and Coffee Meets Bagel through their mobile apps, the user experience these dating apps provide would not be complete without their unique triggered email programs, respectively. Tinder, which amongst other things is known for creating “double opt-in” technology in which two users must both mutually like each other (or “swipe right”) for the app to deem the interaction a “match”. Scoring a Tinder match can feel super exciting, particularly when you’re very interested in the person who swiped right on you. Maybe it was her totally original shot in front of an angel wings mural or the impressive fish he’s holding in every photo, but something caught your attention. But, what happens when you’re too busy to check Tinder or have your push notifications turned off? Do you completely miss out on these match opportunities? Lucky for singles everywhere, Tinder sends out triggered email messages when users are matched. 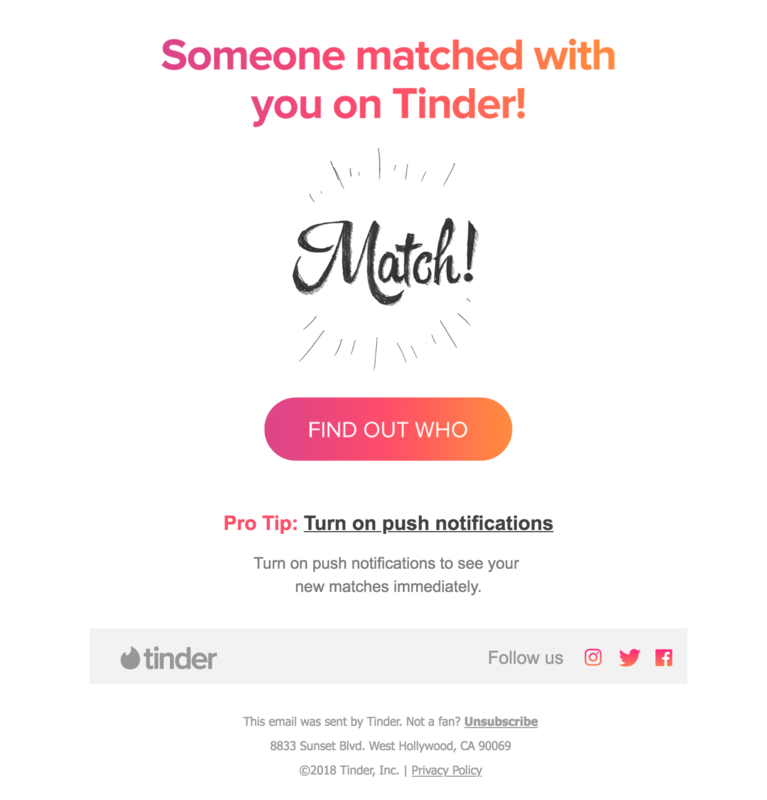 These minimalistic branded emails allow users to easily engage with the app as when the email is viewed on a mobile device the “Find Out Who” CTA button in the email opens up the Tinder app directly to the page that displays a user’s matches. More than that, when clicked on, the “turn on push notifications” hyperlink leads directly to the settings page of Tinder’s app. These app-generated emails lead users directly back to the app itself, creating a seamless full-circle customer experience. We Think You Two Should Meet! 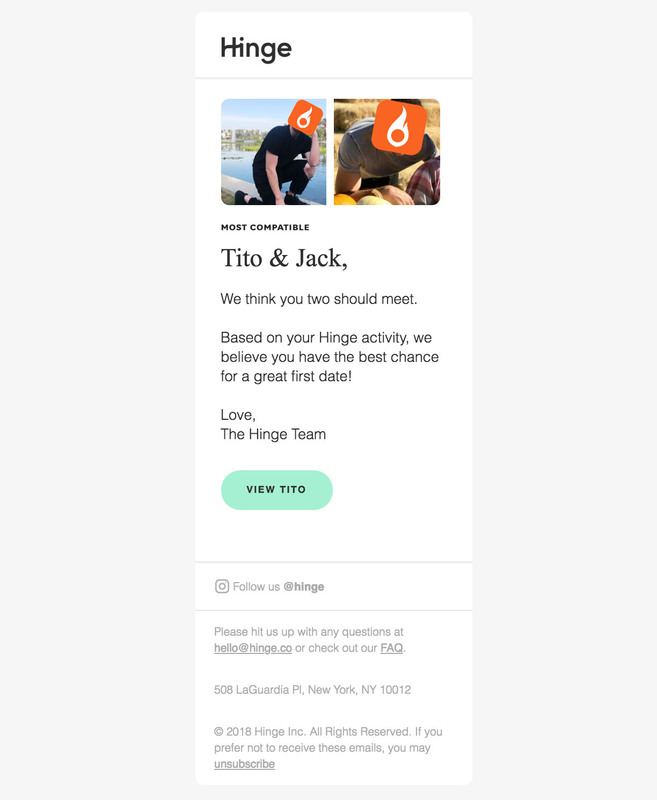 Hinge’s transactional emails not only highlight their unique recommendation feature but also cleverly invite users to engage with the app even though they don’t necessarily have a new match. Similar to the button in Tinder’s transactional Match emails, the light green “View” CTA button in Hinge’s email when viewed on a mobile device leads directly to the user’s profile the app has recommended. Almost instantaneously, users are able to look at a curated potential match, and even if the recommendation isn’t spot-on Hinge has brought users back on to their app where they can continue scouting for potential matches that are more to their liking. While Tinder, Hinge, and Coffee Meets Bagel are certainly not the only dating apps out there communicating with customers via triggered emails, their three different spins on the technology show the importance of app-generated email within the dating space. When it comes to a new match, a promising recommendation, or a potentially great first date, scouting singles deserve encouraging and timely notifications. We may be biased, but the key to finding love may just be checking your email! Our tips for how to keep customers engaged are a great place to start when thinking about how to address customers that may have "ghosted" you.